Blaze Media Pro features two methods for saving audio from a DVD. 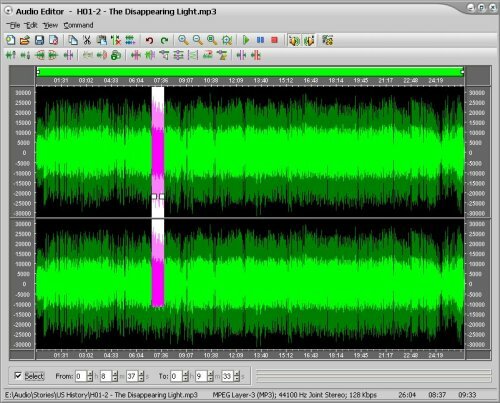 The first method is using the software's DVD ripper feature. It can be accessed from the Conversions menu, via the DVD Video option. From the resulting window, select the tab for the desired output format, and open your DVD drive. You can select the desired title and/or language you want to rip, and click the Convert button to proceed. The DVD ripper feature is feature-rich with options for complete output control, yet the options are optional for ease of use for users of any experience level. The second method can be performed using the software's powerful audio recorder feature to record / convert DVD Audio to MP3, WMA, WAV, and OGG. This is accomplished by recording the sound from the DVD as it plays (in Windows Media Player, or any other DVD player software). To do so, click "Audio Recorder " from the main window's File menu. From the resulting window, you should select the input (volume) source from which you want to record (via a drop down list located on the left-hand side of the audio recorder window). The option to select for this setting will differ depending on your sound card. However, with most sound cards, it is named something like "What You Hear", "Wave", "Wave Out", or "Stereo Mix ". Select the desired output format, and the desired output settings. You are now ready to begin playback of your DVD in Media Player (or any other DVD playback software) and record. With playback in progress, click the "Start Recording" button on the audio recorder window to begin. When the desired playback completes, press the "Stop Recording" button on the audio recorder window. The recorded file can now even be burned to an audio CD, which in turn provides a solution for converting DVD Audio to music CD, or used as a ringtone for many cell phones, for example. The same feature can also be used to record from any source available on your system, such as line-in, "Wave", or "What You Hear". Line-in can be used to record from cassettes or LPs, for example, or you can use "Wave" or "What You Hear" to record from streaming audio online, or anything else that you can hear through your PC speakers produced from the sound card. Audio recordings are saved directly to the output format; no conversion is required. Blaze Media Pro's audio recording features are very fast and easy to use. Advanced options are available for those who want to take advantage of them, though they are completely optional, making Blaze Media Pro the perfect software to convert DVD Audio to MP3, convert DVD Audio to WAV, convert DVD Audio to WMA, or convert DVD Audio to OGG for users of any experience level. Click here for more information on Blaze Media Pro and its DVD Audio recording / converting capabilities or download your copy now.